A Shropshire venue has produced two different fifties in two days. The big mirrors went on the feed at the Avenue, giving Chris Kirk a 92lb brace in 45 minutes and Graham Calverley the 55lb 4oz fish known as Black Scar. Chris arrived on Sunday and initially set up in peg four, but awoke to a cold wind in his face and decided to move round to peg 12 where he had seen signs of fish. He told carpfeed.com: “I just fished single hookbaits into open water where I’d seen the signs. At 6.10pm I had a fish called Moonscale at 42lb 8oz and then 45 minutes late the other rod went and it was Captain Scarlet at 50lb 4oz. 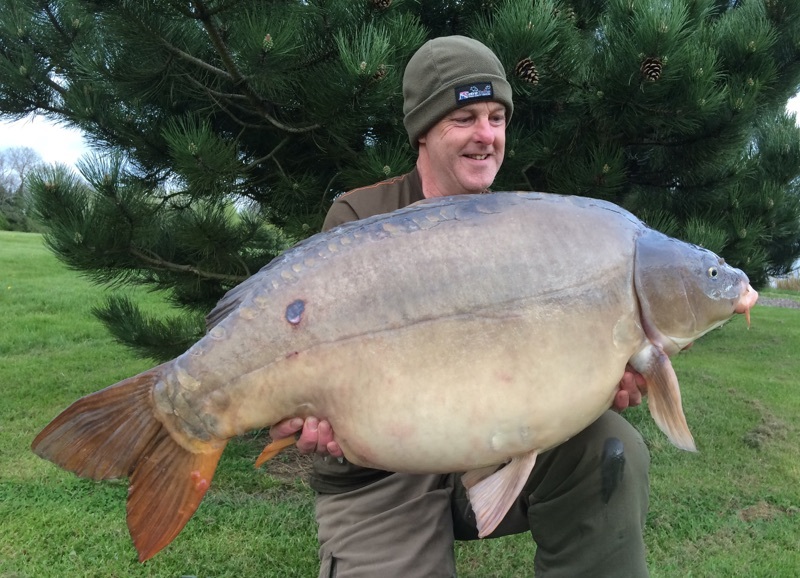 The 45-year-old from Lancashire is in his first season on the Avenue but has already banked 12 carp in nine visits. A day earlier, Graham Calverley had caught Black Scar at 55lb 4oz. He told carpfeed.com he knew exactly when bite time would come and stretched his session accordingly. He said: “I was down for 36 hours from Saturday morning and I stayed as long as I could on Sunday because I knew bite time was generally between 4pm and 5pm – that’s when the fish were showing the previous afternoon. Harry Hales from RH Fisheries and Avenue regular Paul Viner joined the 27-year-old from Saddleworth, Greater Manchester, as the fight progressed. Graham said: “As soon as the fish’s head popped up they said it looked a good forty, then one of them said it could even bigger.